After Napoleon freed a part of Poland in 1817, problems arose for the Polish people. An agreement was made at the Congress of Vienna in Austria. Austria took the Polish Saxony region and Russia took most of Poland. The Russian Czar, “Alexander,” formed the kingdom of Poland, giving it a constitution, an army, and a Polish administration. The Polish people did not like all the restrictions. They remembered the time when they, not the Russians, ruled Eastern Europe. In September 1854, the first organized Polish group of 159 people from Upper Silesia, Poland, with permission slips in hand, left their homes and most of their belongings behind and boarded a train for Berlin, Germany. On Sept. 27, they traveled to Cologne and then on to the port of Bremen, Germany, where they purchased passage to America aboard the 265-ton wooden bark ship “Weser.” The fare for passage to America and Galveston for adults was from 35 to 45 gold thalers. Fare for children under the age of 10 was 5 thalers less and infants were free. More passengers per ship made the fares cheaper. Each emigrant received a specified amount of baggage space both in the hold of the ship and in the steerage quarters. The lighting of fires and smoking tobacco were prohibited and no matches or gunpowder were permitted aboard ship. Firearms had to be deposited with the captain and picked up after the ship docked in Galveston. A small group of the Silesian people did not board the Weser and sailed later on the ship Antonette. The voyage to the U.S. took approximately two months. The Polish emigrants were assigned to the steerage quarters, a dark area with no windows. The area was fitted with board floors and platform-type bunk beds for carrying the emigrants. Two passengers were assigned to each bunk, which they padded with mattresses filled with sea grass and straw. The steerage quarters area was used for cargo on the ship’s return trip to European ports. Passengers aboard the Weser who were not immigrating occupied the upper level and had more space and their own cook. Food and meals were served to the Silesian people in abundance. The ship’s cook, for these passengers, prepared salted beef, salted pork, potatoes, rice, barley, butter, beans, peas, sauerkraut, and dried plums. All the steerage passengers were expected to take turns helping the cook prepare the meals. The emigrants were allowed to bring a limited amount of food with them aboard the Weser. The days were long and the nights were restless as they worried about friends left behind and what they would find in America. The steerage quarters did not get much fresh air. With so many people, it was at times unbearable. Many of the passengers suffered from seasickness. People who died were buried at sea. The bodies were wrapped in canvas with weights attached and pushed overboard. To keep spirits up, many of the Polish families would sing their native songs and tell stories to the children. The nights and days seemed to grow longer. Some of the emigrants questioned their decision to leave their homeland of Poland and wanted to go back home. The Polish Silesians arrived in San Antonio on Dec. 21,1854. Father Leopold Moczygemba greeted them and guided most of them the remaining 60 miles southeast to a place he had selected for their settlement, now known as Panna Maria. The group arrived in Panna Maria near Christmas and established the first Polish settlement in America. (The First Polish Americans by T. Lindsay Baker, page 24) After being in the Panna Maria area for a few weeks, some Silesian families found the area desolate and did not like it. There was little water and it cost 25 cents a barrel. They were frightened by rattlesnakes and could not find the tools and equipment needed to make a living. The news had reached Panna Maria that there was a place called Bandera that had a sawmill and there was work for pay. Bandera was described as beautiful with small hills similar to the Silesian region they left in Poland and with plenty of free water. After celebrating Christmas together, 11 of these families gathered in a small group and decided to leave Panna Maria. In the first week of January 1855, 11 families left and traveled to Bandera through Castroville. Most of the Silesians from the Weser and Antonette chose to settle in Karnes County. A few returned to Poland after they had enough money to buy passage. Originally, Bandera had a Mormon colony, but with the arrival of the 11 Polish families, the Mormons moved to another location. (The First Polish Colonies of America in Texas by Rev. Edward J. Dworaczyk page 101) After arriving in Bandera, the Polish settlers found places to live and made their families secure and as comfortable as was possible. They missed practicing their faith. They met in their homes for the singing of Polish songs and praying. This was the beginning of the second Polish Catholic parish in the U.S. Each family was given a small parcel of land and later purchased more. They built their houses and started farming. The houses they built had thatch roofs and were similar to the ones they left in Poland. The Polish Silesians went to work for established residents in Bandera and soon became substantial members of the community. Some were engaged in making shingles and traveled to San Antonio with wagons full of shingles for sale, others worked in Bandera’s sawmill. The Anderwald, Dugosh, and Kalka families had lived within a mile of each other near Rozmierz in Silesia Poland. In Poland they were builders, rock masons, and carpenters. 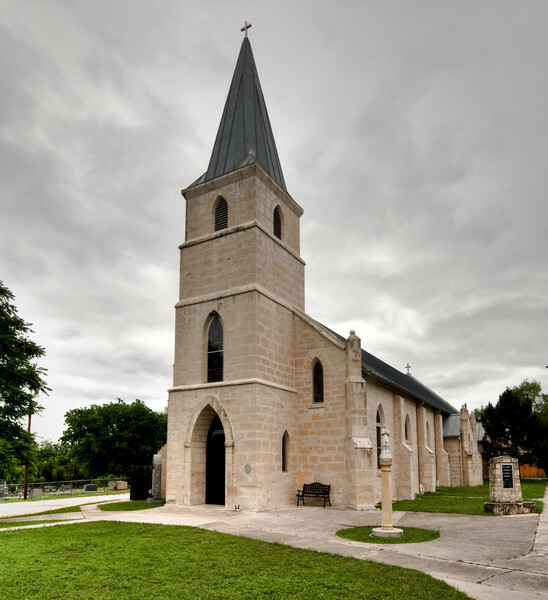 Bandera’s Polish Silesians provided the labor for the St. Stanislaus Catholic Church, the oldest standing continuously-used Polish Catholic Church building in the U.S. They also helped build many of the limestone buildings that are still standing in Bandera today. More families came to Bandera between the 1850s and the 1870s. Some of those who came later were the Louis (Ludwig) Moravietz family in 1859, (Silesian Profiles 11 pages 156-157) the Francis Kalka family in1877, (Annette (Kalka) Schulte) and the Felix Laskowski family in 1917. (Sophie (Laskowski) Mazurek) Bandera never had more than 20 families who emigrated from Poland. In the book written by J. Marvin Hunter “100 Years in Bandera 1853-1953,” (page 6) Constantina (Pyka) Adamietz recalled the following before they boarded the ship in Germany for America: “We started, 16 families in all.” She went on to name 13 of these 16. “Verner, Koerdles, Pittel, John Pyka, Kasper Kalka, Albert Haiduk, Frank Anderwald, Samuel Adamietz, Frank Jureczki, John Dugosh, and three or four more whose names I cannot recall.” The Verner (Anton Werner), Koerdles, and Pittel (Lorenz Pytel) were not among the first Polish Silesians to settle in Bandera. No information or documents have been found to indicate that the Verner (Anton Werner), Koerdles and Pittel (Lorenz Pytel) families were among the first Polish Silesians to settle in Bandera. It is not known if the other three or four names not recalled were Polish. There are many books on Bandera’s history of emigrants and earlier days. Most of this summary is from a few of Bandera’s descendants who listened to their fathers, grandfathers, and great-grandfathers tell stories and then recorded them in their family history. This article is a combination of what I found and read.